June 10, 2006, Stadium Deutweg, Winterthur, 750 spectators. The game started well for the Renegades. In the first drive, the Renegades offense could take the lead by a field goal of Adrian Keller. The defense showed that they are well prepared. Soon they could get the ball back by an interception of Nick Corneil. Unfortunately the offense missed the chance to score further points. The Graz offense did it better; after a short pass and a long run they could score the first touchdown of the game. The offense of the Renegades had problems to move forward. The runs of RBs Lukas Wetzel, Urs Gersbach and Oliver Fröhlich brought little room but the pass play failed. The Renegades had problems with the quick and athletic defense of the Giants. Furthermore, individual mistakes caused penalties, which stopped the Renegades. At half time, the Renegades had two missed field goals, a lot of penalties but no further points on their side. This opposite to the Giants, who scored another two points by a safety after a Renegades snap for a punt went out of the end zone. In the second half, the Renegades came back from the locker-rooms fully motivated again. The strong defense continued where they stopped before the break. The offense couldn’t handle the solid Giants’ defense. The first drive was stopped by an interception, the second one with a fumble in the own end zone, which could be recovered by Graz, scoring another touchdown. After a remarkable kick off return almost over the whole field by Andres Trautmann, Tommy Hackenbruck could score the first touchdown for the Renegades with a short run. The following 2-point conversion failed. Graz gave the answer right away: By another big play they scored another touchdown. The lead could be extended by a field goal. The Renegades defense didn’t allow any more points and brought back the ball again and again, but the offense was not in a position to score anymore. Either the Giants stopped them, or the ball was lost by fumbles or interceptions. Finally, the result was clearly in favor of the Giants. The Renegades didn’t have their best day, which would have been necessary to beat the strong opponent. This years’ EFAF Cup dream ended. 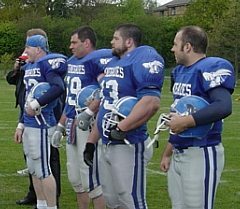 The Renegades can be proud of their 3 clear victories against the Templiers d’Elancourt, Amsterdam Crusaders and in the ¼ final against the English P.A. Knights. Now the Renegades will concentrate on the Swiss Championship to defend their title. The position is good after 4 victories in 4 games, but the recent close results show that the title isn’t won yet.